James Casey, director of AU's Office of Sponsored Programs. Starting Tuesday, September 27, the National Council of University Research Administrators (NCURA) will feature American University as the October “Institution of the Month.” Every Tuesday in October, AU research administrators offer best practices and professional advice to fellow university research administrators in a mere 2-3 minutes in the NCURA’s “YouTube Tuesday” videos. This comes less than a year after the Carnegie Classification of Institutions of Higher Education moved AU up to “Doctoral: Higher Research Activity” from “Doctoral: Moderate Research Activity.” AU’s ascension up the Carnegie Classification ladder resulted in part from a strategic increase in externally-funded research productivity. 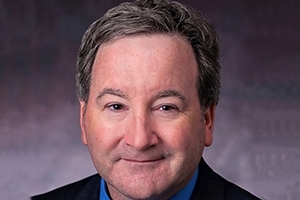 In an edited interview below, James Casey, director of AU’s Office of Sponsored Programs—the administrative office charged with managing externally funded research—discusses how AU being an NCURA “Institution of the Month” contributes to the university’s mission to become a premier research institution. UC: This is the first time AU has been the “Institution of the Month” for the NCURA’s YouTube Tuesday videos. What is the significance of this? What does it say about AU's status as a research institution? JC: Having AU featured as the “Institution of the Month” for the NCURA YouTube Tuesday videos increases AU’s visibility within the global research administration community. It provides our research administrators with an opportunity to be seen as experts in the field of university research administration. After I sealed the deal with NCURA to have AU featured as the October institution of the month, I encouraged members of AU’s Grant Administrators Roundtable to participate. It’s important to have AU featured as an up-and-coming institution in research administration. We want our peers to know the AU we know. We want them to see it as an institution comprised of professional research administrators who are trained to assist faculty and staff to take AU to a higher level of sponsored research funding. When it comes to professional development and training, and best practices in research administration, standing still is not an option. Successful universities know this. Related content: Watch all the AU NCURA videos on the NCURA's YouTube channel. UC: How do the NCURA YouTube Tuesday videos benefit all university research administrators? Are policies and compliance issues changing so often that it helps to have a more immediate forum to which people can turn for expert advice? Is this a popular way for research administrators to share best practices? JC: Research administrators around the world—as well as the general public—can watch these videos. The field of research administration is constantly changing and these videos provide NCURA members with real-time opportunities to learn more about new and upcoming changes in the field. The videos are one of numerous ways research administrators share best practices—others are the NCURA Magazine, NCURA’s scholarly journal (Research Management Review), and other print and digital media. As the former inaugural senior editor of the NCURA Magazine, and editor of Research Management Review, I understand the importance of sharing best practices across multiple platforms. The best part about the videos is, they are free. You don’t need a subscription to watch them. Plus, they do not require a lengthy time investment as they are only 2-3 minutes each. UC: It looks like you have done a few of these NCURA videos before. How many total have you done? JC: I filmed two NCURA YouTube Tuesday videos in early 2013.These were about contracting and management topics. Last fall, the NCURA Professional Development Committee asked if I would do the videos again to update the information as there had been changes in these areas during the past three years. These updated videos were published on the NCURA YouTube channel a few weeks ago. While we were updating those two videos, we did a third on best practices of managing international projects. So to date, I have done five NCURA YouTube Tuesday videos. A sixth video will be published in the near future. It will focus on the legal dimensions of research administration, which will be based on a chapter I authored for NCURA in April 2016. Related content: “Research Enterprise,” an April 2016 Q&A with James Casey.